SNOOKER BAIZE BLOG: World Snooker Championship 2011 - Day 11 - QFs are under way! 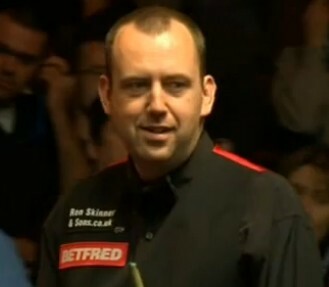 World Snooker Championship 2011 - Day 11 - QFs are under way! Trump takes the first two frames. Dott struggules at the beginning, he misses a chance to get his first frame, he is 0-3 down on Trump. Dott steals the frame from Trump, Trump still leads 3-1 before mid session. Trump extends his lead to 7-1 with 86, 64, 58, 69 at the end of first session. It already shows some tension in the first frame between Marks, Williams forces a respot black while he needs one snooker. Williams wins the respotted black and enjoy a good start, 1-0. Mark Allen missed the tricky red to the middle, he was punished by losing another frame. Allen pulls one back with 78. Williams is 3-1 ahead of Allen with 119 before mid session. Williams leads 4-1 with another 78. 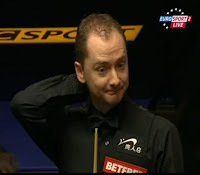 Allen misses frame balls in key moments, he starts to misbelief himself. Williams steals another frame from Allen. 5-1. Allen comes through from the shawdow, winning the last two frames with 100, 102. Williams leads Allen 5-3 after the first session. A high quality session :-) Really enjoy it! Where is the Selby we saw yesterday? Selby starts off the match with 124, he takes the first frame 1-0 up on Ding. Ding takes a 3-1 lead over Selby before mid session. 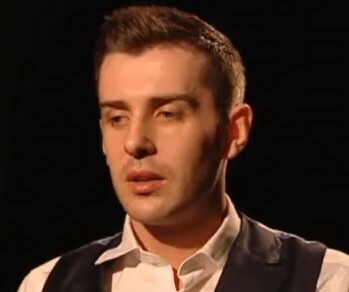 Selby made several mistakes in safety which is not seldomly seen from him, he feels pressure competiting with top players. Ding takes advantage in both safety and scoring. Ding goes 5-2 with 77 before last frame in the session comes. Selby wins the last frame of the session and trails 3-5 on Ding Junhui. Higgins takes the opening frame after a safety battle, follows with the second. Ronnie pulls one back with table clearance. Ronnie levels the match before mid-session, long pots of Ronnie are improved today. 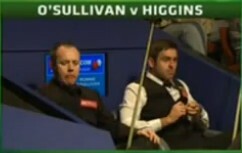 Higgins steals the frame from Ronnie, back into lead 3-2. Higgins hit a 121 to extend his lead 4-2. Ronnie catches a mistake by Higgins, plays black out of position and pulls one back with 89. Ronnie successfully levels the match before mid session. All square for the first session, 4-4. In the last session, Dott was not in the match and Trump leads 7-1. Trump moves forward to lead 10-2 with 50, 104, 79 before mid session. I guess Dott is about to cry... After mid session, Dott really makes a comeback. He takes three in a row after Trump takes another frame. In the last three frames, his scorings are really heavy, 72, 120, 122. He missed the maximum in the 15th frame, running out of position when he plays the last black, fail to go on with the yello. Dott trials 5-11 behind Judd Trump. Dotty needs eight frames tomorrow to win while Trump only needs two more. Williams has two frames advantage before the second session starts. Williams takes the opening frame with 80 to lead 6-3. Allen wins a scrappy frame but then Williams wins the other two before mid session. Williams enjoys a 7-4 lead before mid session.